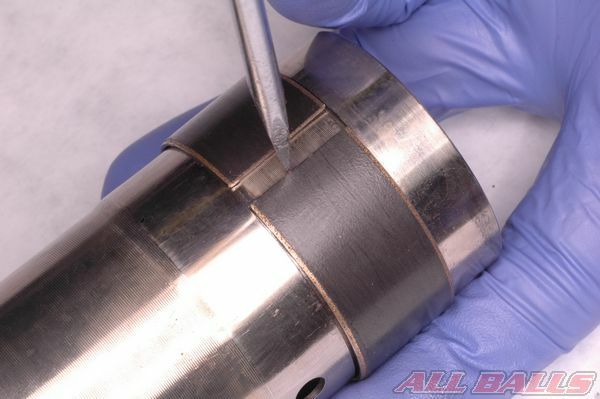 Forks, especially advanced designs found on high performance motorcycles, often require special tools for service. Also, new fork oil will be needed. 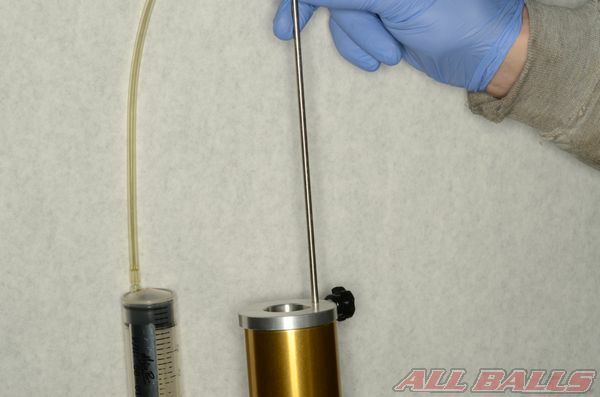 Consult the service manual ahead of time to have the proper tools and fork oil on hand. 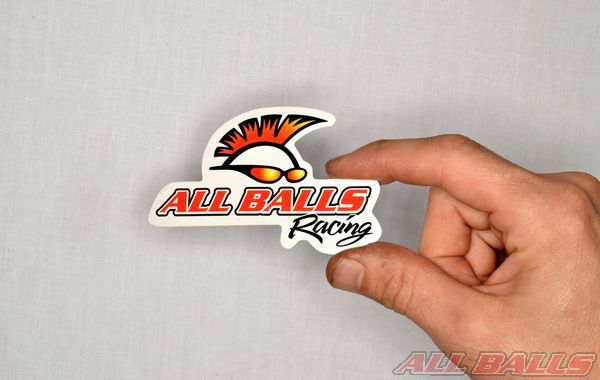 Get your fork seals and fork bushing kits from ALL BALLS RACING. 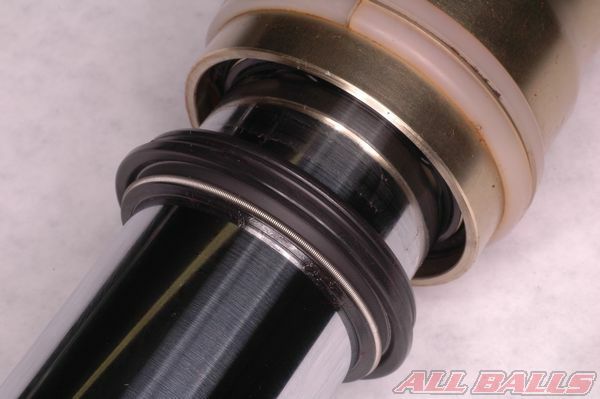 The fork seals kit includes the the dust and oil seals for both fork legs. 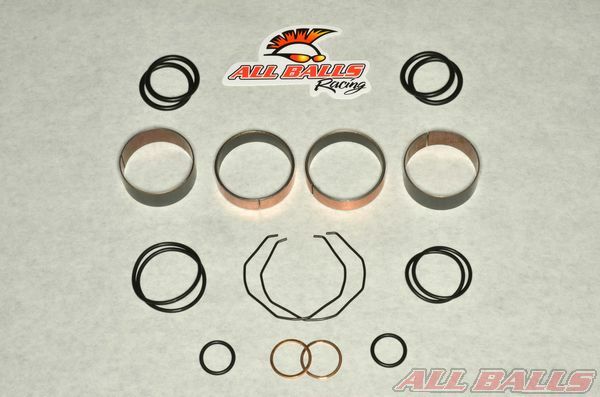 The fork bushing kit includes the the fork bushings, O-rings, sealing washers and seal snap rings required to complete a full fork rebuild. The forks must be disassembled to replace the seals anyway, so it is a good ideal to have all of the rebuild parts on hand. 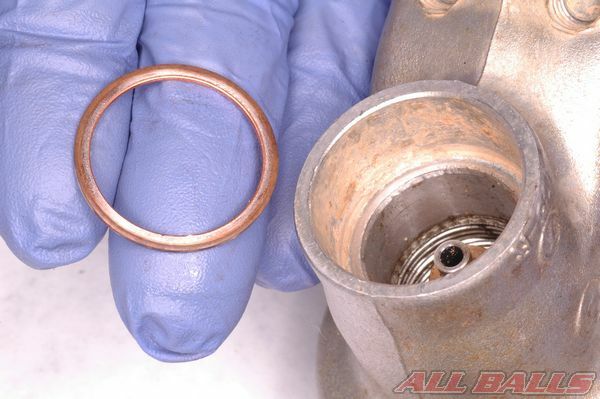 OEMs often recommend replacing all of the O-rings and sealing washers anytime the fork is disassembled, and having new bushings and snap rings on hand is always a good idea when servicing a fork. 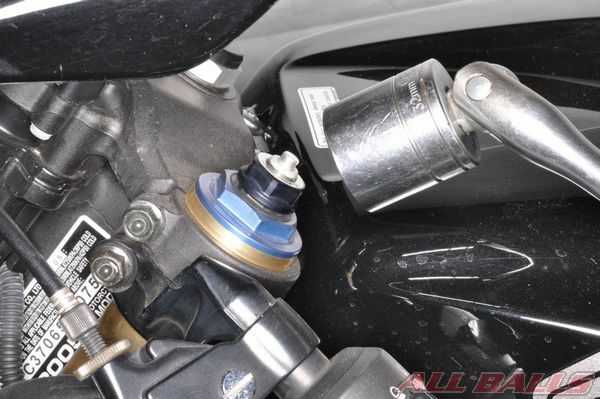 Record the suspension damping adjustment settings. 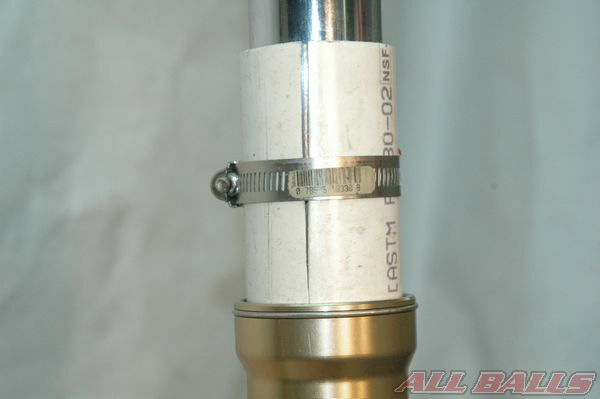 Generally the damping adjusters should be turned to the full soft position prior to disassembling the fork. Check the service manual for more information on the particular model. It is helpful to loosen a threaded fork cap while the fork leg is held securely by the fork clamp. 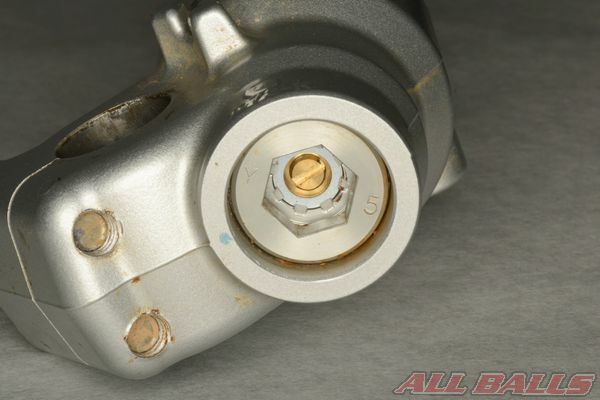 Loosen the upper fork clamp pinch bolt, but leave the lower fork clamp bolt tight to hold the fork leg from turning when the cap is loosened. 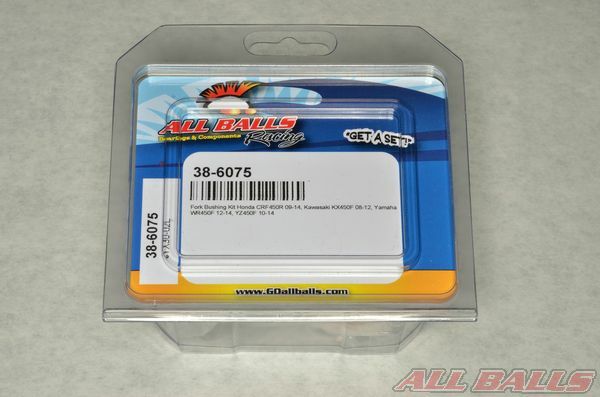 do not fully remove the fork cap until the fork has been removed. Danger: Never remove a fork cap while the vehicle’s weight is being supported by the front suspension! Slide the forks down and out of the fork clamps using a twisting motion. Disassemble the fork according to the instructions in the service manual. Pour the oil out of the forks. Stroke the slider up and down with the forks inverted to expel as much oil as possible. Pry the dust seal out of the slider with a small flat-blade screwdriver. Be careful to not scratch the forks. 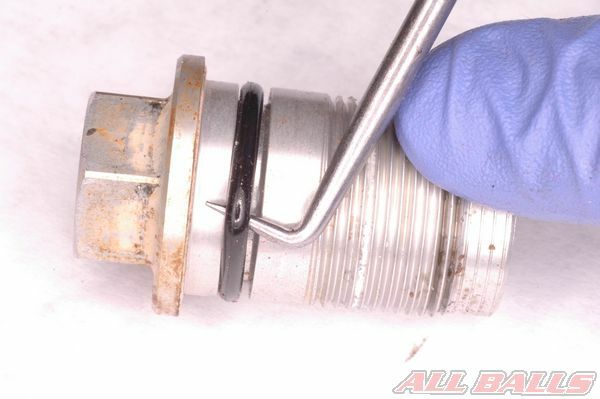 Remove the retaining clip from the fork slider with a small flat-blade screwdriver. Be careful to not scratch the fork tube. 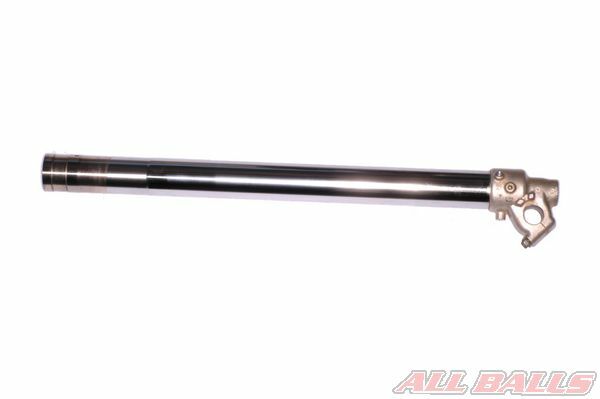 Use a slide hammer motion to separate the fork tube from the slider. Check the fork tubes for bending with a straight edge. Always replace bent fork tubes, do not attempt to straighten them. 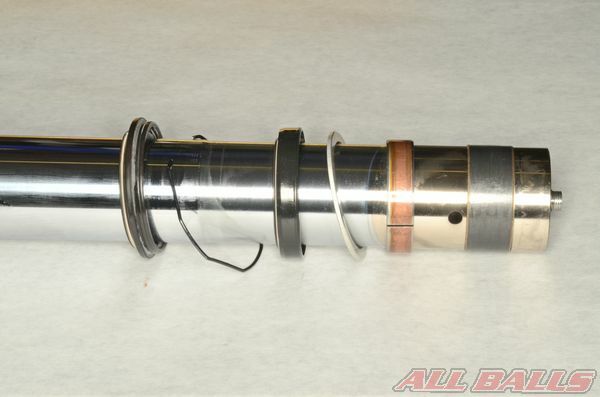 The fork tube will come out of the slider with all the above parts in place. 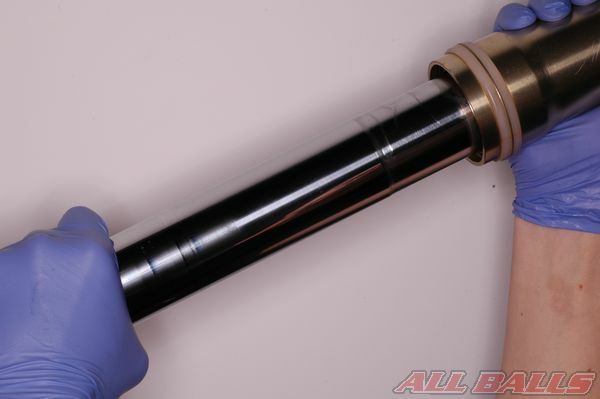 If you replace the fork seals or bushings make sure to return the parts to their correct order on the fork tube before reassembly. 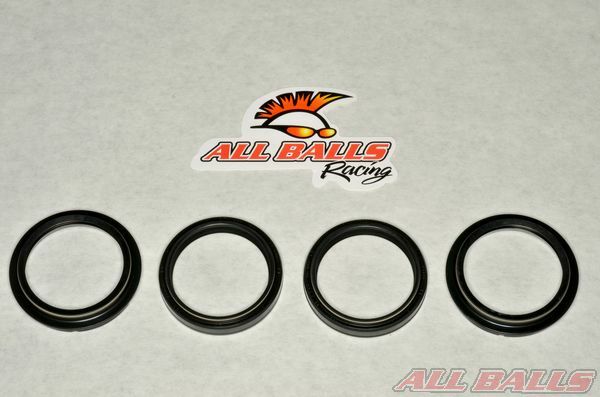 From left: dust seal, snap ring, oil seal, oil seal washer, outer tube bushing, inner tube bushing. 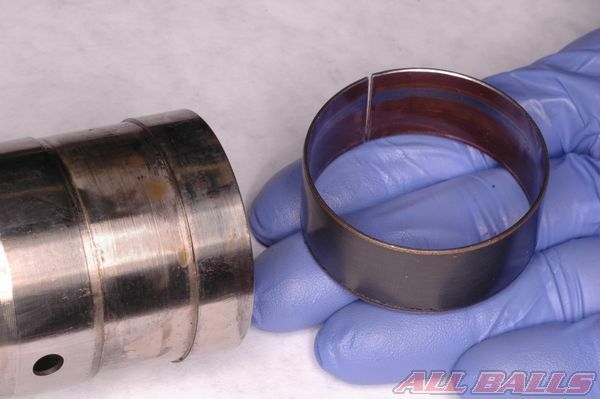 Replace the bushings if they show significant signs of wear. 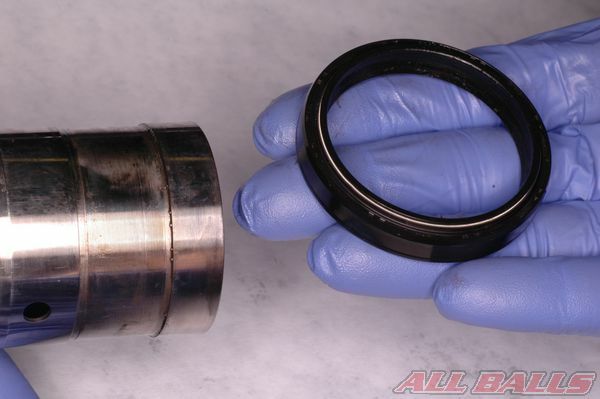 Check the particular service manual for any OEM recommendations on fork bushing wear service limits. 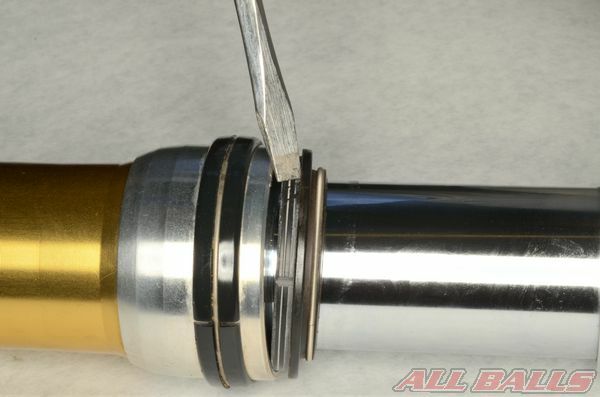 Remove the inner tube bushing by gently prying it apart with a flat blade screwdriver and sliding it off of the fork tube. 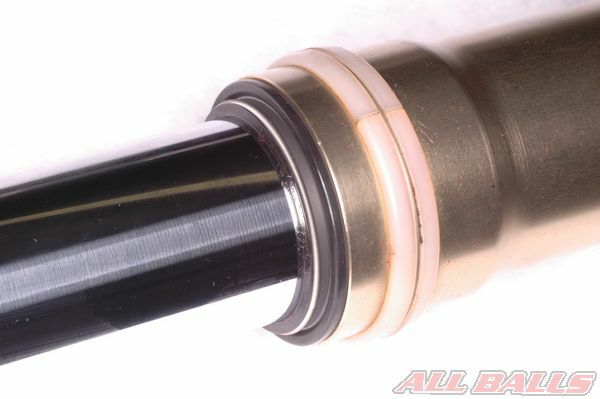 Slide the remaining bushing, seals, washer, and snap ring off of the fork tube. 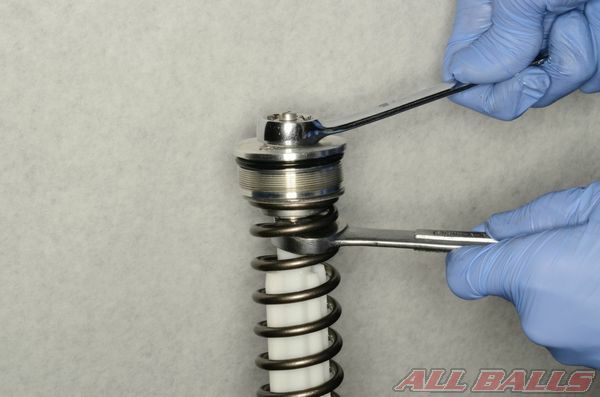 Clean the fork legs with aerosol brake cleaner and a lint free cloth. 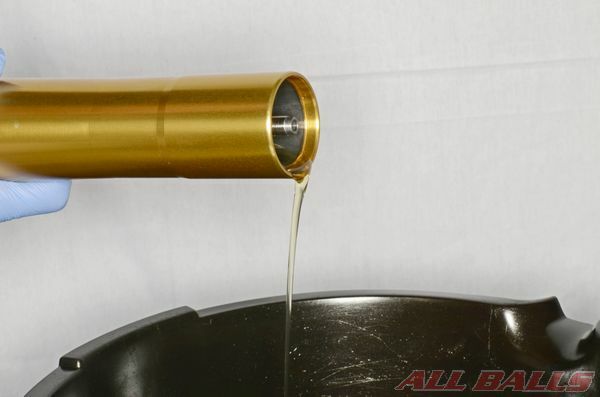 Coat the bushings and seals with fork oil before installation. 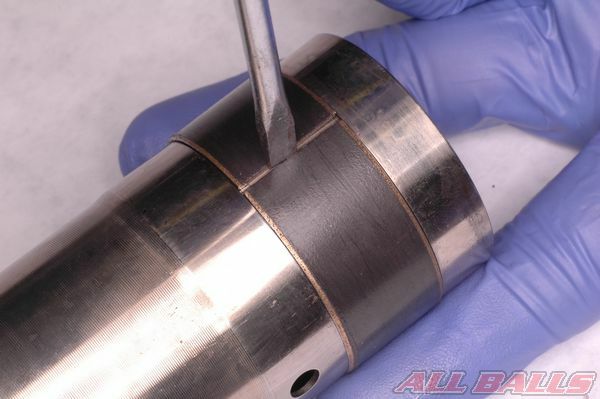 Take care to not damage the coating on the bushings during installation. 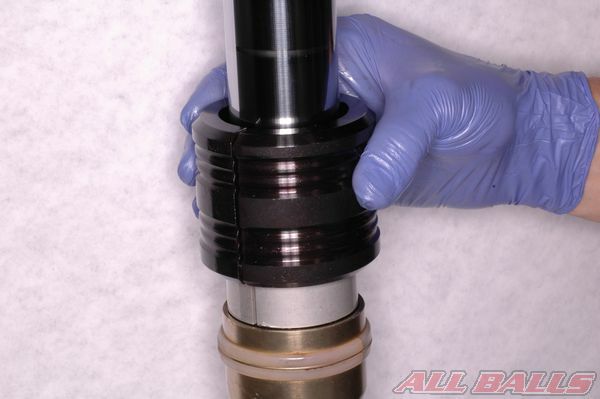 Make sure to position the fork seals in the correct orientation during installation. Cover the end of the fork tube with plastic to prevent damage to the fork seal lips as they are installed onto the fork leg. 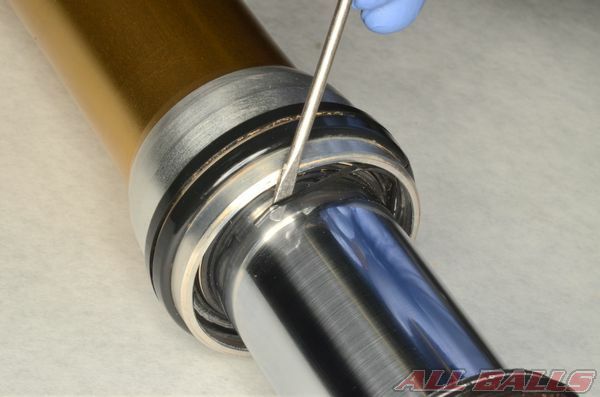 Install the dust seal, snap ring, oil seal, oil seal washer, outer tube bushing, and inner tube bushing onto the inner fork tube. 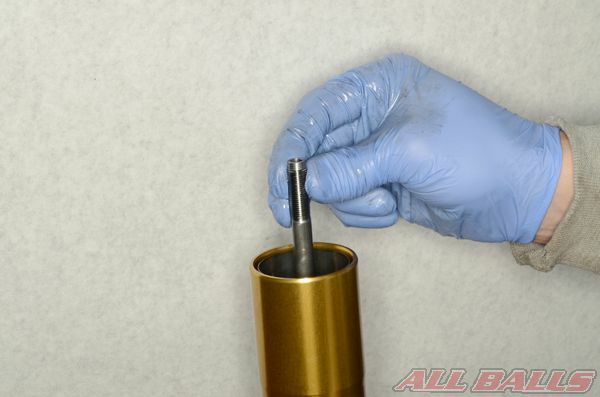 Coat the bushings in fork oil. 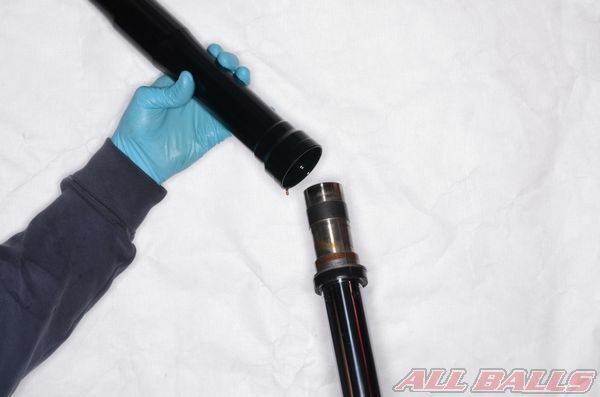 Insert the inner fork tube into the outer fork tube. 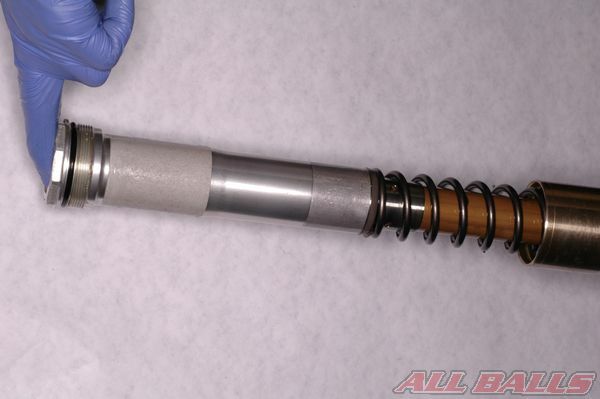 Reassemble the fork according to the vehicle’s service manual. 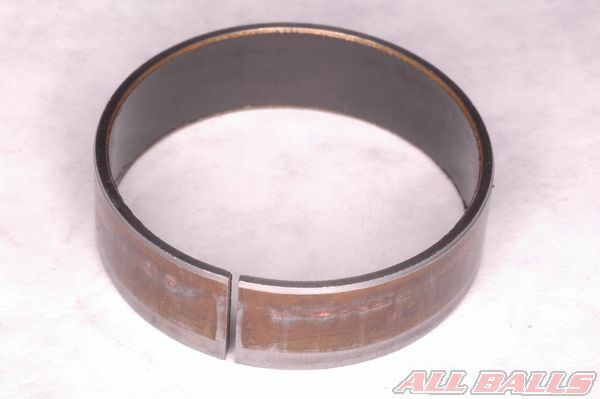 Use a fork seal driver to drive the slider bushing into the outer fork leg, place the fork seal washer between the fork seal driver and the bushing. 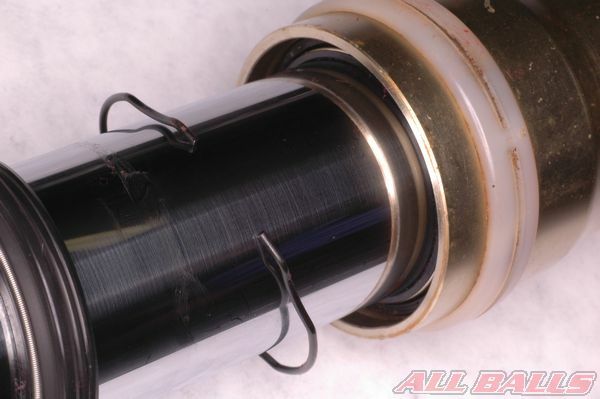 Make sure the bushing is fully seated in the outer fork tube. 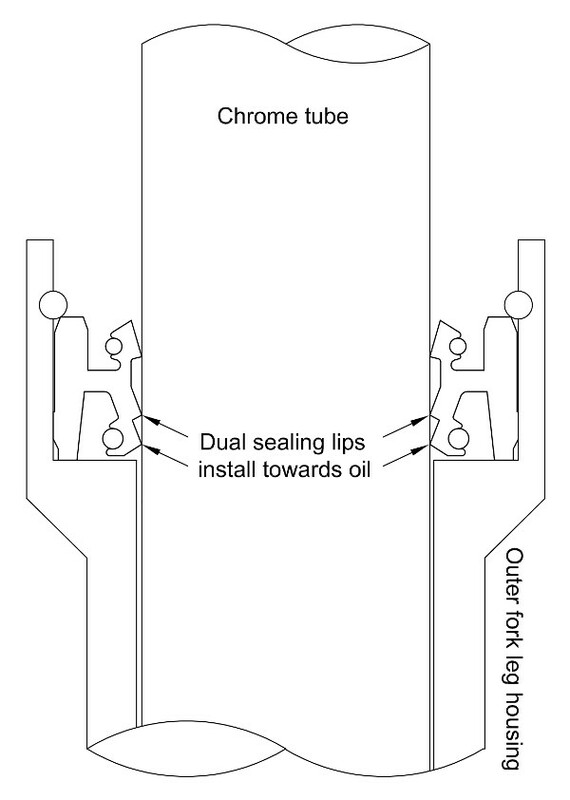 If a fork seal driver is not available, a length of PVC pipe can be used, split down the middle and held together with a hose clamp as shown. 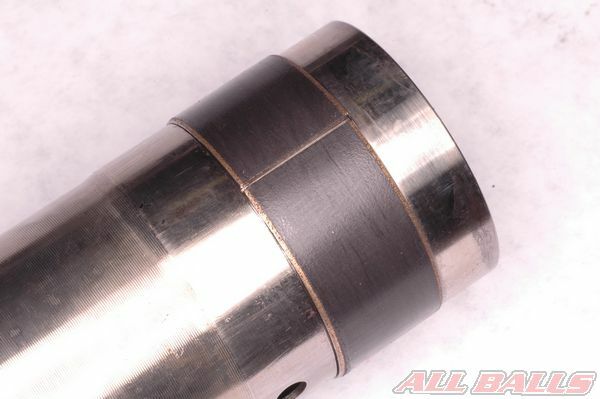 Use the same method to drive the fork seal in place until the groove for the retaining clip can be seen. 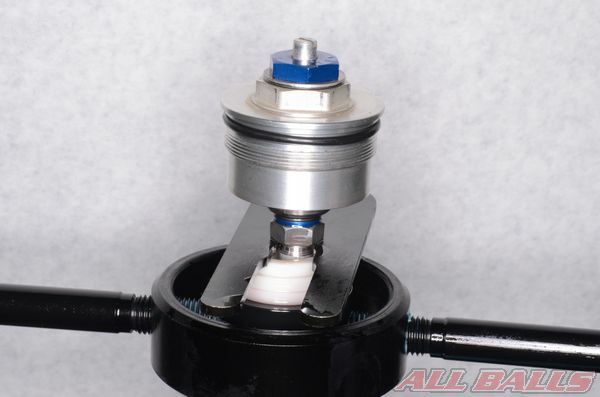 Insert the snap ring into the fork slider and make sure the ring is seated in its groove. Fit the dust seal into place. 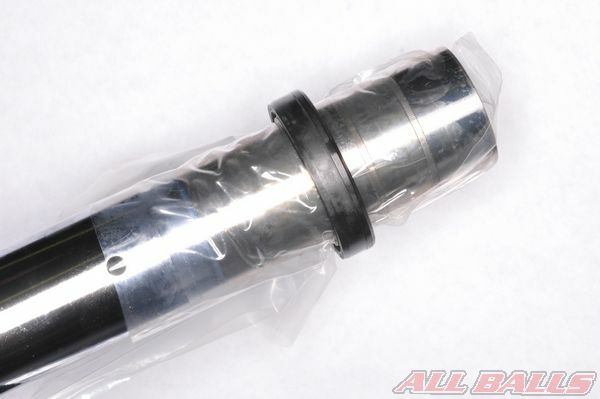 Use the fork seal driver to seat in in the outer fork tube if needed. 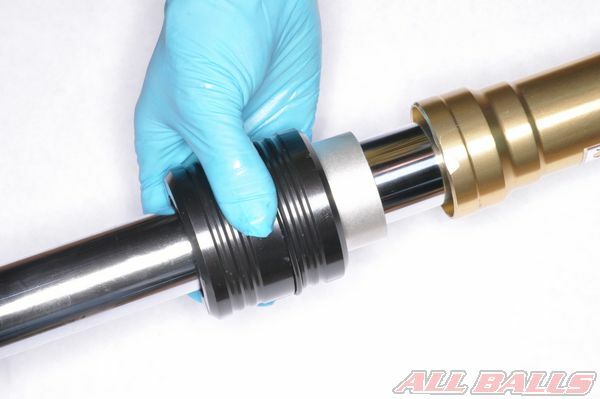 Fill the fork with oil according to the OEM specifications and instructions. 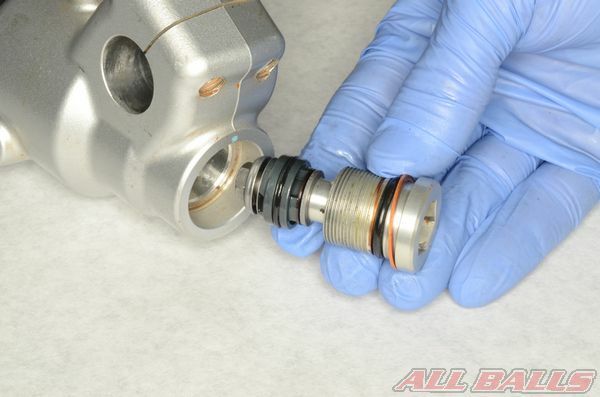 Pump the fork or damper assembly through its stroke to bleed the air from the fork oil. Fully compress the fork and allow the fork oil to settle. 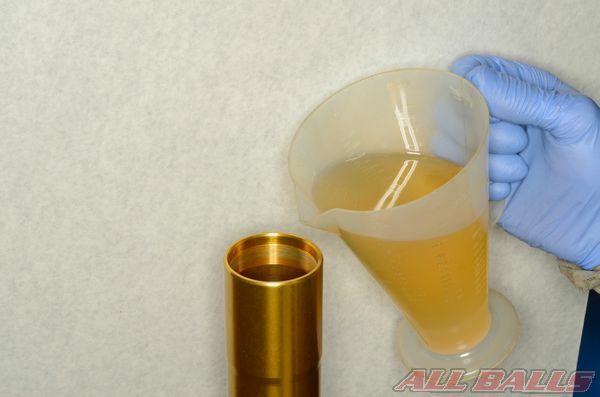 Set the fork oil level with a fork oil level tool without the spring installed. 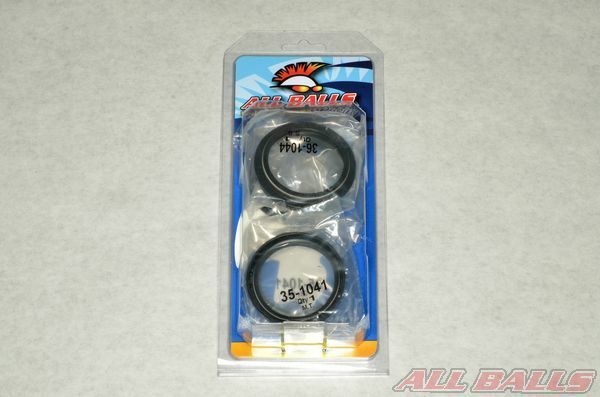 Install the remaining fork components, with new O-rings, sealing washers, and tighten the fasteners to specification. Torque the fork caps to specification after the forks have been returned to their clamps. Return the suspension damping settings to their original positions.